Youlgrave football club has been formed for well over 70 years, playing their home games on the Alport Lane Playing Field pitch in Youlgrave all that time. 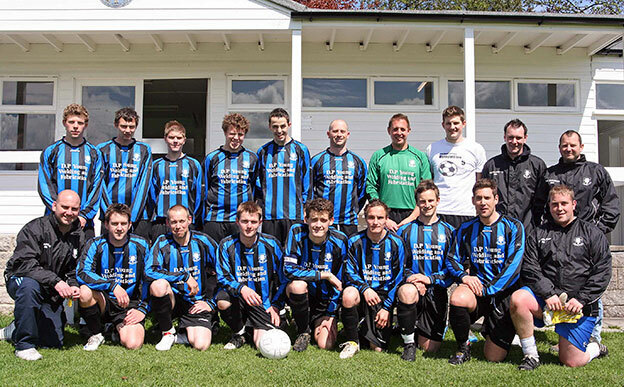 The team plays at present in the premier division of the Hope Valley League, gaining promotion to this division in the 2012/2013 season. The team is managed at present by James (“fish”) Bacon, who fills this position with an undaunting passion. The chairman is Robert Tabbenor, secretary is Susan Dawson. There are several (Pommy) old boys still alive and “kicking” in the village and if you have any photos of previous players or teams please e-mail them to us so we can put them on the site. Like any village group, the team can only survive with new, young players and donations – both money or general help. For offer of help or more information contact James Bacon on 07866 365610.